Leave plenty of time for this to simmer away in the oven - that is the secret to having juicy, tender chunks of meat in this stew. Set the oven at 400º to preheat. Trim excess fat from the pork and cut into large chunks - about 2 inches square. Heat a couple tablespoons olive oil in a cast iron brazier [see blog post for detail]. Dry surface of pork well, and sprinkle generously with the salt and pepper. Brown evenly in the hot oil, but don't overcrowd the pan. Don't turn it too often or mess with it a lot - let it alone so it can develop some nice color on it. You might need to do this in two batches to ensure it gets well browned. Add the onions and peppers, and let them cook for about 5 minutes, until they start to take on some color. Add the garlic and cook for about 1 minute. 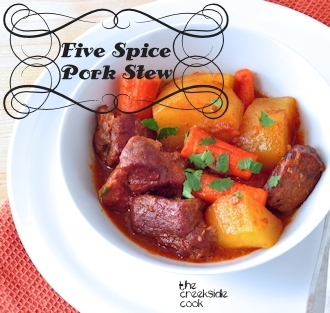 In a medium bowl, combine the tomato, 1 cup of the chicken stock, the five spice, cumin and smoked paprika, then pour the mixture carefully over the pork. Bring up to a simmer, and then place in the preheated oven. Cook in the oven for about 90 minutes, until pork is very tender. Carefully add the potatoes and carrots, along with some more of the stock - up to another cup, so that liquid about ½ fills the pan around the meat and vegetables. Cook another 30 minutes or so, until vegetables are done. Stir in some torn cilantro leaves, and sprinkle some on top as well. Serve in shallow bowls, with a bit of butter to round out the flavors.